Anti-inflammatory drugs make up approximately half of all analgesics (painkillers) on the market and refer to any drug that controls pain and inflammation in the body. Popular analgesics include ibuprofen, ketoprofen and naproxen. Some of the most common non-steroidal anti-inflammatory drugs (NSAIDs) on the market today are Advil and Aleve. When there is an inflammation response in the body due to trauma, prostaglandins and thromboxanes are produced by the cyclooxygenase (COX) enzyme. Anti-inflammatories work by blocking the pathway of this enzyme, thereby inhibiting production of these substances and curbing the body’s natural inflammatory response. People use NSAIDs for a number of ailments, including reducing fevers and dulling pain caused by headaches, arthritis, sprains and other muscular traumas and injury from day-to-day life as well as sports and accidents. NSAIDs are also used to ease cold and flu symptoms. The medication can be obtained over-the-counter (OTC) or through prescription. It can be delivered to the body in capsule or tablet form, in ointment and creams, in liquids such as eye drops, and in injections. People who take NSAIDs run the risk of suffering from serious side effects. The drugs should not be taken at all if the patient suffers from any stomach issues, as gastric bleeding may occur. The gastrointestinal threat may be more severe if the meds are combined with selective serotonin reuptake inhibitors (SSRIs). In 2005, the Food and Drug Administration (FDA) advised that the medication in its various forms increases the likelihood of a person suffering a cardiac abnormality, such as a heart attack or stroke, and therefore the medication should never be administered after a coronary artery bypass graft. The FDA further stated that the gastrointestinal bleeding caused by NSAIDs could be severe and even fatal. It is estimated over 16 thousand arthritis patients alone die each year due to NSAID use. 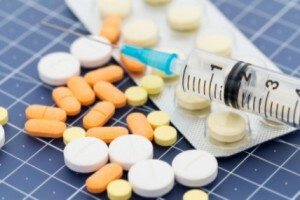 The drugs may also cause sudden acute renal failure with even short-term use in people with certain risk factors, including those suffering from systemic lupus erythematosus and alcohol abuse, or the elderly or infirmed. Long-term use may cause chronic damage to the kidneys (analgesic nephropathy). – The increased risk for a cardiovascular damage can occur within just a couple weeks, with the risk steadily increasing per continued use. – Research has shown that the risk is dependent on which NSAID is prescribed along with the patient themselves, although those with current heart disease or those at higher risk for it are more likely to suffer a heart attack or stroke. – Patients who have suffered an initial heart attack or stroke that are treated with any form of NSAID is at higher risk of dying within the first year of the incident than those who were treated with other analgesics. – The risk of heart failure, in general, is increased in all patients, regardless of medical history. With this information at hand, it is no wonder why individuals suffering from chronic pain are concerned about their health and want to find viable treatment alternatives. Even doctors are becoming increasingly worried about the over-prescribing of these medications. – Dr. David Williams recommends alternatives like turmeric and magnesium. – Andrew Weil, M.D. offers a full diet to combat inflammation in the body. – Sharon Hertz, M.D. collaborate with the FDA to review the benefits and risks of NSAIDs. – There are over 600 articles on Mercola.com about the dangers of NSAIDS and viable alternatives.